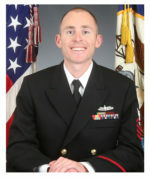 Chief Petty Officer Zachary Quirk enlisted in the Navy in June 2011 and completed Recruit Training in Great Lakes, Illinois. After graduating from Fire Controlman class “A” school, he then completed SPY-1 B/BV/D training at Aegis Training and Readiness Center, Dahlgren, Virginia. In 2017, CPO Quirk volunteered as an Individual Augmentee to the Combined Air and Space Operations Center (CAOC) on Al Udied Air Base in Qatar in support of Operation Spartan Shield, Inherent Resolve, Restore Hope, and Freedom Sentinel. CPO Quirk developed and led CAOC Integration Training for vessels operating in the 5th Fleet Area of Responsibility which dramatically improved Naval integration into the overall CENTCOM air defense design. During his time there, CPO Quirk also assumed the role of BMD Liaison Officer, typically a Navy O3/O4 and was the intermediary between deployed Naval BMD assets and the Area Air Defense Commander. During this period, he identified a communication breakdown and drove the creation of a new Upper-Tier BMD communication net which improved communication flow between joint missile defense units from the Navy, Army, and Air Force. In the final period of CPO Quirk’s CENTCOM deployment, he qualified as Senior Air Defense Officer (SADO), a position normally filled by an Air Force O3/O4. He was the first enlisted service member to qualify as a SADO since the start of Operation Inherent Resolve in June of 2014. CPO Quirk is currently stationed onboard USS Russell (DDG 59), where he serves as a CF Division Leading Chief Petty Officer and SPY-1D technician. CPO Quirk’s personal decorations include the Air Force Commendation Medal, Navy, and Marine Corps Achievement Medal (three awards) and various campaign and service medals.